James T. Black, Sr., D.D.S. Achievement has always been a mantra for Oklahoma native, Dr. James T. Black. Special recognition is something that has come along over the years for this businessman and dentist for his ability to provide jobs, goodwill and economic development for the Los Angeles community. Dr. Black graduated from Tennessee State University where he earned a B.S. degree in Biology. He went on to receive a Doctor of Dental Surgery degree from Loyola University, Chicago College of Dental Surgery. Along the way, Dr. Black was among the first class at the famed Michael Reese Hospital of Chicago, Illinois to receive the first Medical Technology Certification Award. Having served in the military, Dr. Black was awarded the commendation award for Meritorious Service. Upon arriving in Los Angeles, Dr. Black served as a Los Angeles County Public Health Officer and Dental Coordinator for the County’s Head Start Program. He then began his private practice where he has served the Crenshaw community for nearly 40 years, having one of the country’s largest dental practices, employing 32 individuals with an active patient load of over 25,000 patients. Dr. Black is a member of the Los Angeles Dental Society, the California Dental Association and the American Dental Association. He serves on several dental health plans and peer review committees. Dr. Black is a member of Kappa Alpha Psi and Sigma Pi Phi fraternities. He is also an active member of the African-American group of the National Diabetes Education Program. 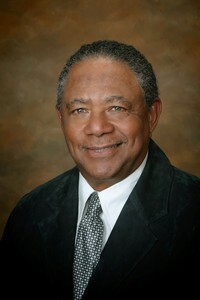 Dr. Black served as President of the Los Angeles Chapter of the 100 Black Men of America from 1997-1999. He is currently National Chairman of the Health and Wellness Committee and is a member of the Executive Committee’s member at large. Dr. Black is responsible for increasing Chapter awareness of diseases in the African-American communities and assisted in initiating the 100 Black Mens National Blue Print for Action on Prostate Cancer. This guidebook is being used by all 105 chapters and other organizations to educate, screen and assist groups in their efforts to impact the African-American communities in their prostate cancer awareness programs. Dr. Black currently serves as National Health & Wellness Emeritus for the 100 Black Men of America and is an active member of the Xi Boule of Los Angeles, California where he served as Sire Archon for the years 2005-2007. Dr. Black resides in Los Angeles with his wife, Joyce T. Black. They have two children and five grandchildren.